卜涛, 余吉远, 过磊, 王国强, 郭琳, 计波. 甘肃北山大豁落南地区晚二叠世花岗闪长岩成因——锆石U-Pb年龄和岩石地球化学制约[J]. 地质通报, 2019, 38(2-3): 254-265. 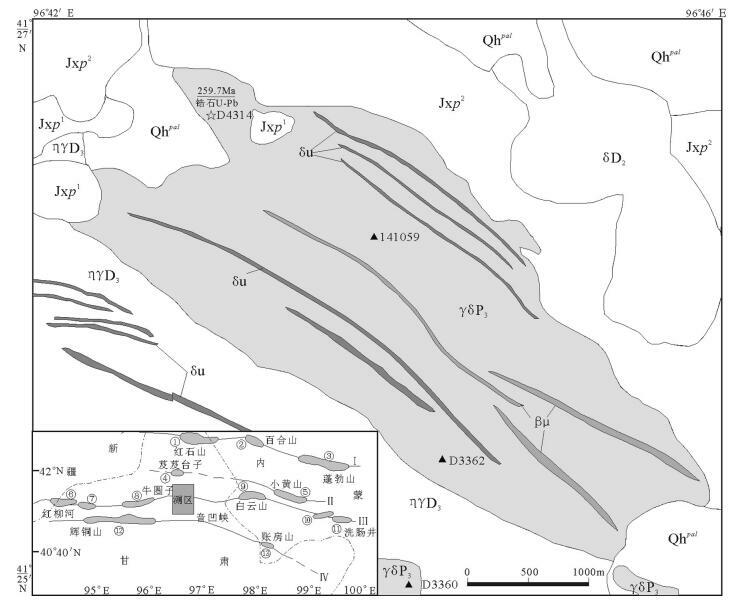 Bu T, Yu J Y, Guo L, Wang G Q, Guo L, Ji B. Petrogenesis of the Late Permian granodiorite in southern Dahuoluo area, Beishan, Gansu: Constraints from zircon U-Pb geochronology and geochemistry[J]. Geological Bulletin of China, 2019, 38(2-3): 254-265. 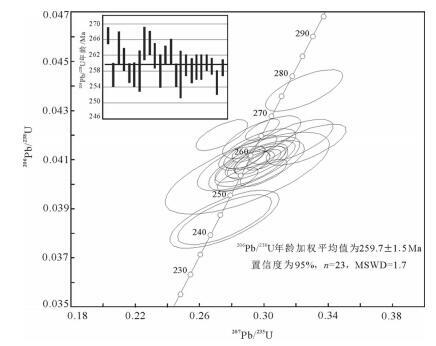 Abstract: This paper reports LA-ICP-MS zircon U-Pb ages and whole rock major and trace elements from granodiorite in southern Dahuoluo area of the Beishan region. 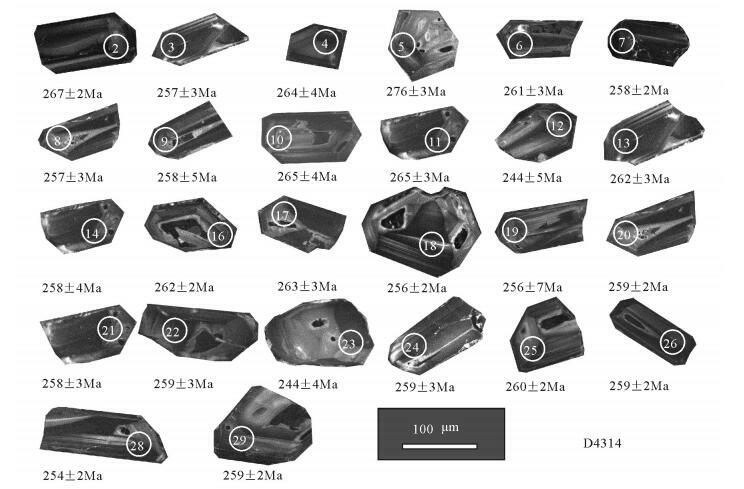 Magma zircons from granodiorite yielded a weighted 206Pb/238U mean age of 259.7±1.5Ma. 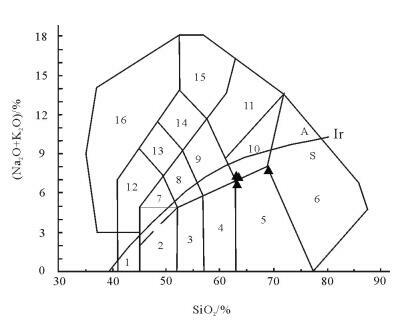 Granodiorite is characterized by SiO2 ranging from 63.10% to 69.69%, Al2O3 ranging from 14.86% to 15.48%, 15.21% on average, MgO ranging form 0.96%~3.59%, 2.69% on average, strong enrichment of LREE, and (La/Yb)N values ranging from 18.60 to 50.91. In addition, Eu anomaly is not obvious, with Eu/Eu* values ranging from 0.83 to 1.06, Sr content is high (454×10-6~862×10-6) and Sr/Y ratio is 44.95~60.35, rocks show geochemical characteristics of adakite. Granodiorite is enriched in K and depleted in Na, and has high Cr, Ni and Mg#(50.31~66.75). Combined with regional geological background, the authors hold that granodiorite was formed after the collision, as a product of both intraplate thermal upwelling extension and crust-mantle interaction. It is suggested that, in Late Paleozoic, the crust in Beishan area was in vertical increment, and the granites associated with the Permian and mantle-derived magmas were in the form of synchronic tectonic magmatic events. 聂凤军, 江思宏, 白大明, 等. 北山地区金属矿床成矿规律及找矿方向[M]. 北京: 地质出版社, 2002: 1-408. 刘雪亚. 甘肃北山区的钙碱系列岩浆活动及其与板块构造的关系[J]. 中国地质科学院院报, 1984, 10: 151-163. 左国朝, 何国琦. 北山板块构造及成矿规律[M]. 北京大学出版社, 1990: 1-226. 左国朝, 张淑玲, 何国琦, 等. 北山地区早古生代板块构造特征[J]. 地质科学, 1990(4): 305-314. 穆治国, 左国朝. 甘肃北山古生代造山带地壳演化的同位素和稀土元素地球化学特征[J]. 北京大学学报(自然科学版), 1994, 30(2): 202-214. 孙桂英, 张德全, 徐洪林. 格尔木-额济纳旗地学断面走廊域花岗岩类的岩石化学特征与构造环境的判别[J]. 地球物理学报, 1995, 38(S2): 145-158. 修群业. 甘肃北山地区花岗岩类地球化学特征及大地构造意义[J]. 前寒武纪研究进展, 1999, 22(1): 31-39. 梅华林, 李惠民. 甘肃柳园地区花岗质岩石时代及成因[J]. 岩石矿物学杂志, 1999, 18(1): 14-17. 江思宏, 聂凤军. 北山地区花岗岩类的40Ar/39Ar同位素年代学研究[J]. 岩石学报, 2006, 22(11): 2719-2732. 王立社, 杨建国, 谢春林, 等. 甘肃北山火石山哈尔根头口布花岗岩年代学、地球化学及其地质意义[J]. 地质学报, 2009, 83(3): 377-387. 韩宝福, 何国琦, 王式洸, 等. 后碰撞幔源岩浆活动、底垫作用及准噶尔盆地基底的性质[J]. 中国科学(D辑), 1999, 29(1): 16-21. Jahn B M, Wu F Y, Chen B. Granitoids of the Central Asian Orogenic Belt and continental growth in the Phanerozoic[J]. Journal of Earth Science, 2000, 91: 181-193. Jahn B M, Wu F Y, Chen B. Massive granitoid generation in Central Asia:Nd isotope evidence and implication for continental growth in the Phanerozoic[J]. Episodes, 2000, 23: 82-92. 赵茹石, 周振环, 毛金海, 等. 甘肃省板块构造单元划分及其构造演化[J]. 中国区域地质, 1994(1): 28-35. 刘雪亚, 王荃. 中国西部北山造山带的大地构造及其演化[J]. 地学研究, 1995, 37-48. 杨建国, 谢春林, 王小红, 等. 甘肃北山地区基本构造格局和成矿系列特征[J]. 地质通报, 2012, 31(2/3): 422-438. Luding K R. ISOPLOT3.00:A Geochronological Toolkit for Microsoft Excel[J]. Berkeley Geochronology Center Special Publication, 2003, 4: 1-70. Cox K G, Bell J D, Pankhurst R J.The interpretation of igneous rocks[M]. George, Allen and Unwin, London, 1979: 115-120. Sun S S, McDonough W F. Chemical and isotopic systematics of oceanic basalts: Implications for mantle composition and processes[C]//Saunders A D, Norry M J. Magmatism in the ocean basins. London, Geological Society Special Publication, 1989. Wang Q, Zhao Z H, Bai Zh, et al. Carboniferous adakites and Nbenriched arc bassltic rocks association in the A lataw Mountains, north Xinjiang:Interactions between slab melt and mantle peridotite and implications for crustal growth[J]. Chinese Science Bulletin, 2004, 8(19): 2108-2115. Wang Q, Wyman D A, Zhao Z H, et al. Petrogenesis of Carboniferous adakites and Nb-enriched arc basalts in the A lataw area, northern Tianshan Range western China:Implication for Phanerozoic crustal growth of Central Asia Orogenic Belt[J]. Chemical Geology, 2006, 236: 42-64. 张旗, 王焰, 钱青, 等. 中国东部燕山期埃达克岩的特征及其构造-成矿意义[J]. 岩石学报, 2001, 17(2): 236-244. Liu S, Hu R Z, Feng C X, et al. Cenozoic adakite-type volcanic rocks in Qiangtang, Tibet and its significance[J]. Acta Geologica Sinica, 2003, 77: 187-193. Wang Q, Zhao Z H, Xu J F, et al. Petrologenesis and metallogenesis of the Yanshanian adakitelike rocks in the Eastern Yangtze Block[J]. Science in China(SeriesD), 2003, 46(Supp): 164-176. 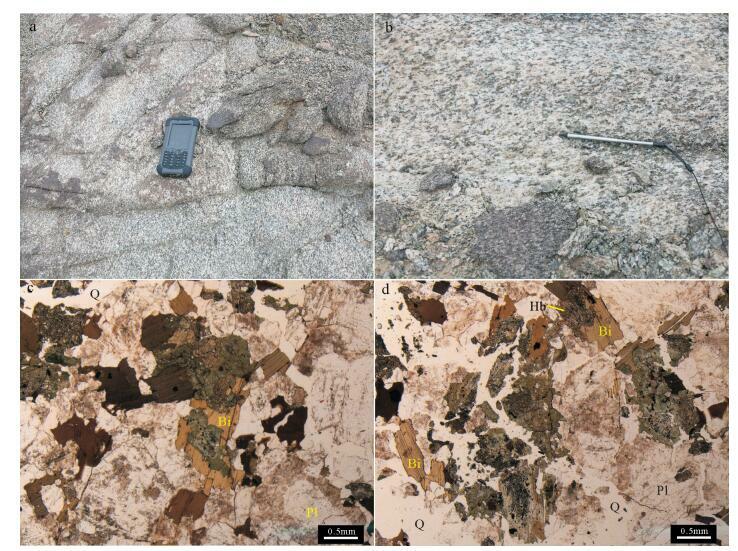 Ma C Q, Yang K G, Ming H L. The timing of tectonic transition from compression to extension in Dabieshan:Evidence from Mesozoic granites[J]. Science in China(Series D), 2004, 47: 453-462. 刘红涛, 张旗, 刘建明, 等. 埃达克岩与斑岩铜矿-浅成热液金矿:有待深入研究的岩浆成矿关系[J]. 岩石学报, 2004, 20(2): 205-218. 翟明国. 埃达克岩和大陆下地壳重熔的花岗岩类[J]. 岩石学报, 2004, 20(2): 193-194. 肖龙, Rapp RP, 许继峰. 深部过程对埃达克质岩石成分的制约[J]. 岩石学报, 2004, 20(2): 219-228. Xu J F, Shinjio R, Defant M J, et al. Origin of Mesozoic adakitic intrusive rocks in the Ningzhen area of east China:Partial melting of delaminated lower continental crust[J]. Geology, 2002, 12: 1111-1114. Wang Q, Xu J F, Jian P, et al. Petrogenesis of adakitic porphyries in anextensional tectonic setting in Dexing, SouthChina:Implications for the genesis of porphyry copper mineralization[J]. Journal of Petrology, 2006, 46: 119-144. Rapp R P, Watson E B. Dehydration Melting of Metabasalt at 8~32kbar:Implications for Continental Growth and Crust Mantle Recycling[J]. Journal of Petrology, 1999, 36(4): 891-931. Lassiter J C, Depaolo D J. Plumes/Lithosphere Interaction in the Generation of Continental and Ocranic Flood Basalts:Chemical and Isotope Constrationts[J]. Geophysical Monography 100, American Geophysical Union, 1997, 26(5): 335-355. Taylor S R, Mclennan S M. The Continental Crust:Its Composition and Evolution[M]. Oxford: Blackwell, 1985: 91-92. 姜常义, 程松林, 叶书锋, 等. 新疆北山地区中坡山北镁铁质岩体岩石地球化学与岩石成因[J]. 岩石学报, 2006, 22(1): 115-126. 赵泽辉, 郭召杰, 韩宝福, 等. 新疆东部-甘肃北山地区二叠纪玄武岩对比研究及其构造意义[J]. 岩石学报, 2006, 22(5): 1279-1293. 吴福元, 孙德有, 林强. 东北地区显生宙花岗岩的成因与地壳增生[J]. 岩石学报, 1999, 15(2): 181-189. 韩宝福, 季建清, 宋彪, 等. 新疆准噶尔晚古生代陆壳垂向生长(Ⅰ)——后碰撞深成岩浆活动的时限[J]. 岩石学报, 2006, 22(5): 1077-1086. 顾连兴, 张遵忠, 吴昌志, 等. 关于东天山花岗岩与陆壳垂向增生的若干认识[J]. 岩石学报, 2006, 22(5): 1103-1120. 张文, 吴泰然, 贺元凯, 等. 甘肃北山西涧泉子富碱高钾花岗岩体的锆石LA-ICP-MS定年及其构造意义[J]. 岩石矿物杂志, 2010, 29(6): 719-731. 张文, 冯继东, 郑荣国, 等. 甘肃北山音凹峡南花岗岩体的锆石LA-ICP-MS定年及其构造意义[J]. 岩石学报, 2011, 27(6): 1649-1661.